I am disappointed that this is not an arachnid faction. They would be a bunch of web developers. If you have flight points go to Lorlathil in Val'sharah. The Npc you need to see to turn this in is standing only a couple yard from the Flight Master. Tece-sonhos 98-110 Val'sharah ~0/12k Honored Isso é Val'sharah, amigos! Valarjares 98-110 Trommheim ~0/12k Honored Vraikal e me conta tudo, irmão! At level 110 you will get A união das ilhas quest. Need to have Friendly with the 5 major Legion factions. So complete 1/3 quests in each zone and you can do world quests. Do world quest in zones assotiated with it's faction. As Guardiãs target all 5 zones with WANTED and DANGER quests. After you complete 4 world quests of the faction you see on your map, you can go to the emissary and claim your reward. You will always get 1 reputation Insignia like Insígnia Maior da Tribo Alta Montanha. The list is at the bottom of this post. You have 3 daily quest and you have 3 days to complete it. So it feels like daily, but you can just wait 2 days and then complete all 3 quests. No need to do them every day. They work similar to the dungeon or raid lockouts. Everyone have the same 3 quests. You can get +250 reputation Insignia (like Insígnia da Tribo Alta Montanha) from lots of treasure chests in all 5 zones. I'm not sure if it's correct, but from my experience you get +250 reputation from running dungeons on heroic and higher difficulty. But you get reputation only once a day, or maybe there is some other limitation. If you're missing some reputation from honored after completing val'sharah, find Old Grizzleback. The 4 quests there(one found) should get you over. That is all well and groovy, however, if you have a character that is already 110, and has completed the Val'Sharah area quests (and received the Achievement), how do you raise your reputation further with the Dreamweavers? min post is utterly wrong with the assumption you can get 'loads' of insignia's from chests. This is incorrect. The drop rate in the chest is abysmally small. 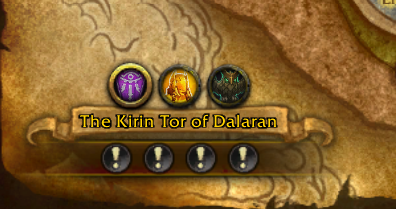 However where you can get these a little more frequently is in the order hall quests..once you pretty much completed most, they start to pop up as bind on account rep for your other toons..
in my opinion an absolutely pointless thing being bind on account..why? firstly most people are going for the flying pathfinder, not rep grind on every character..since there is actually no purpose to doing so, unless your sadistic or have an severe illness such as OCD. As I said, they have an abysmal drop rate in the chests, and takes an exceptionally long time to obtain via quests in your order hall. In fact its a well know you will be revered / exhalted with nightfallen and the other factions before your likely to even see these things. Not sure why the original poster slapped up those insigian tokens as if they are some common and easy to aquire. They have an very low drop rate (0.3%) from chests. This is why pretty much hardly anyone has ever had these insignia's from the chests. You could loot every chest in the game, and never get a single insignia then multiply that by players. In fact I have a very hard time believing they even exist in chests, regardless of what blizzard say. They made wild claims of nonsense regarding low drop rate chance (bad luck protection) that actually doesn't even exist in the game and they won't answer the question at all...despite a really dodgy video in beta making claims it existed. Where you can get these insignia's from is from the order hall quests, after you have pretty much exhausted them all, which will also take a long time. Th original post is full of wrong , needs to either be edited or deleted and a fresh post made, because the vast majority of the stuff written is actually wrong or misleading to new players, or those that have come here for help. Black Rook Hold gives no rep for Dreamweavers. Os druidas e seus aliados em Val'sharah protegem o Sonho Esmeralda desde o início dos tempos.